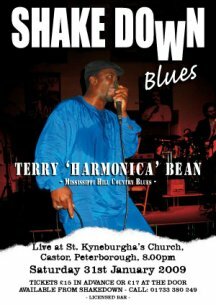 Terry �Harmonica� Bean is one of the new generation of Mississippi blues artists currently breaking through into the blues scene. He has three albums to his name and is looking to cut more�..
I�m from Pontotoc, Mississippi � born in 1961. My father�s name is Eddie Bean. There was 23 of us in my family. My mother and father had fifteen kids and she already had four kids before they even started and every Thursday, Friday, Saturday and Sunday, in Pontotoc, Mississippi, they played the blues at my father�s house. They would play music, they would shoot craps, drink whiskey and fight. They�d get to fighting because one of them got broke and when one of them lose all their money they get mad at you and want to fight somebody. That�s the way it was but it used to scare me to death. My mother left when I was a year old, so my daddy raised me and twelve boys. My mother had the rest of �em. I didn�t know nothing about no blues music but my dad did. One of my friends, a white friend of mine down the road from me, had a guitar. His daddy had bought it for Christmas � a guitar and amplifier, they wanted twenty dollars for it. So I ran back to my house and tell my daddy about it. My dad told him to bring it on up, so they did. He got it and paid him twenty dollars for it and he started playing that thing. That�s when it started. Man, my dad was playing that thing and I can look back now and see the sounds that he was doing. Muddy Waters, �cause man he could do that stuff and then I found out he used to play with B. B. King way back in the day but he couldn�t get out and to on the road �cause he had to play, and work in the fields. So B.B. King came down from Indianola around all those places and my daddy used to run down those places but anyway he was doing all that stuff and then I had two brothers start playing. My daddy formed this band and they started playing and he�d have his friends come over. They was just a blues band they didn�t have no name and come to find out that my daddy he had had a band way back before then, him and some of his first cousins. I mean these guys could sing and they started coming back over when he got the band together and sometimes we would go to their house and we�d have a blues thing going. I decided to break out in 1988 and started coming to the Delta and the first man I met was T. Model Ford. Me and him hooked up and I played with him for about three years just locally. Just coming down from Pontotoc, down to Greenville, and then me and him split up and I got my own thing going. I got a blues band and I�ve got a one man band act too. The band is called Terry �Harmonica� Bean and His Blues Band. I play some of the Mississippi juke joint places and that�s to black folks. The juke joints are all gone now; they tore them down in Pontotoc County. The last one that was there was Junior Kimbrough�s place and it got burnt down. I like music and if it�s got a good sound to it, I�ll listen to it. Now I ain�t no rapper, I�m not into that, to me that ain�t no music. Music I like is Bukka White, Howlin� Wolf, Jimmy Reed and all these guys. I try and keep peoples like Muddy Waters, Howlin� Wolf and all these guys that have passed on, I try and bring �em back. I cut an album called �Here I Am� by Terry �Harmonica� Bean and His Blues Band that was done in Helena, Arkansas. One side of the CD is done with the band, the other side is a one man band. My first record was called �Jus Messin� Aroun�, I done go no more of them. I�m going to get some more of them done. I�ve been doing some stuff with Slick Ballinger and he�s signed with a label out of Nashville and he wanted me to join him but I couldn�t because what he does is good but it�s not my thing. I�m looking at something else. I just wanna get out and play. I ain�t looking to get rich. If the good Lord lets me do what I wanna do I�m rich. I�d like to make a little money out of it but I want to get out and play and have fun. What gets me about the blues is that I could be out playing and old peoples come around and they get the beat and they hang around and it makes their day. Because they ain�t heard that stuff for so long and when they hear it, it makes them happy and it makes me happy. �Jus Messin� Roun�: �Rockin� In The Dirty South�: �Here I Am Baby� all self-released and available from CD Baby at www.cdbaby.com or from Cat Head Records.